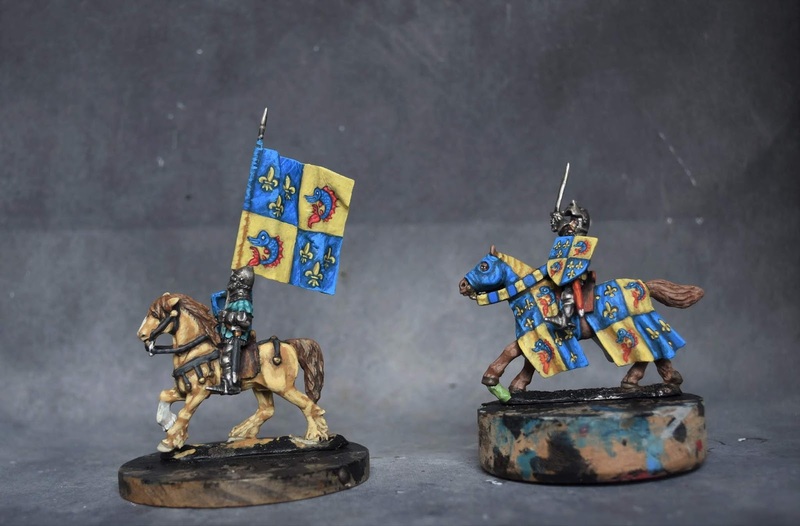 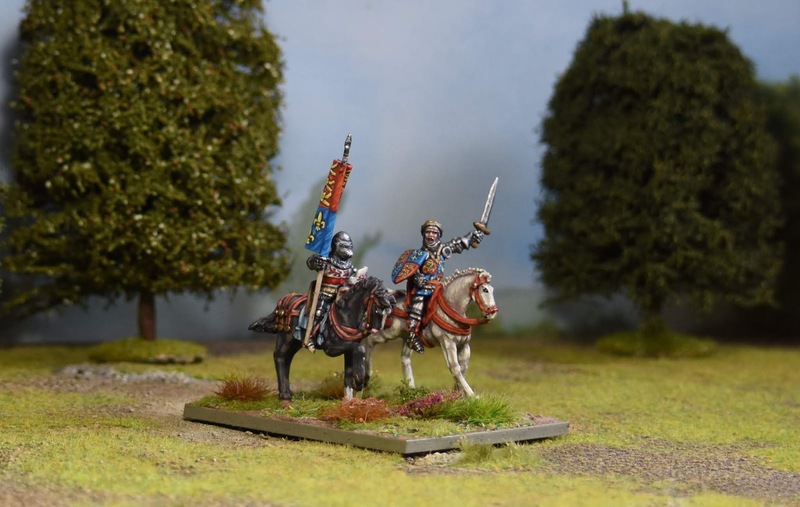 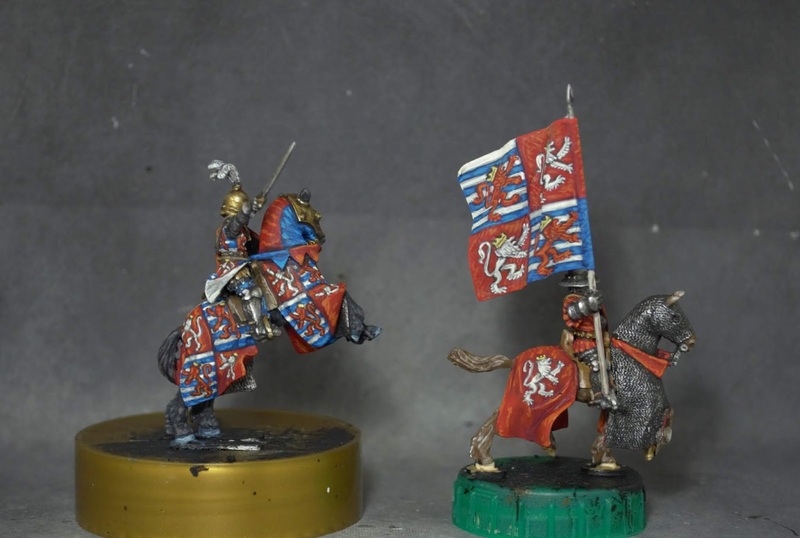 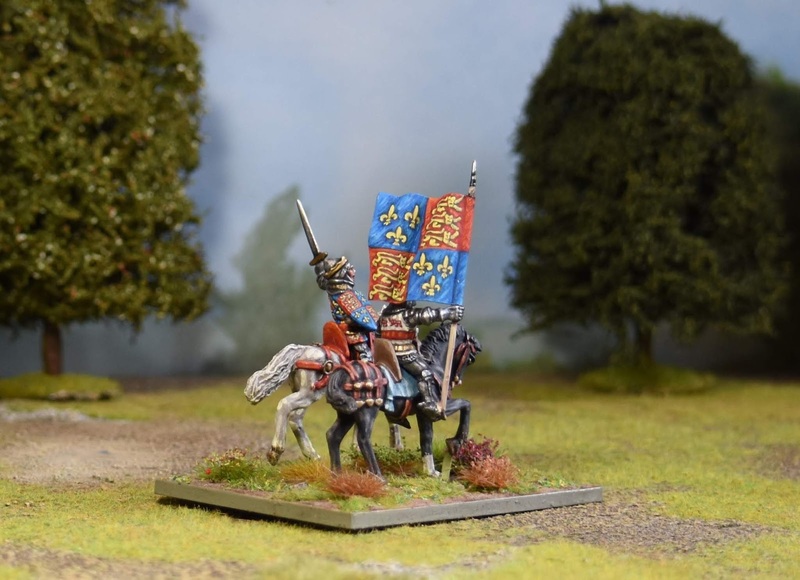 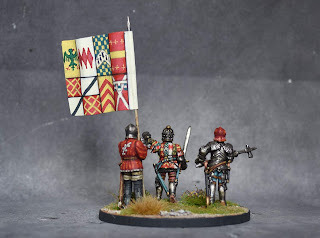 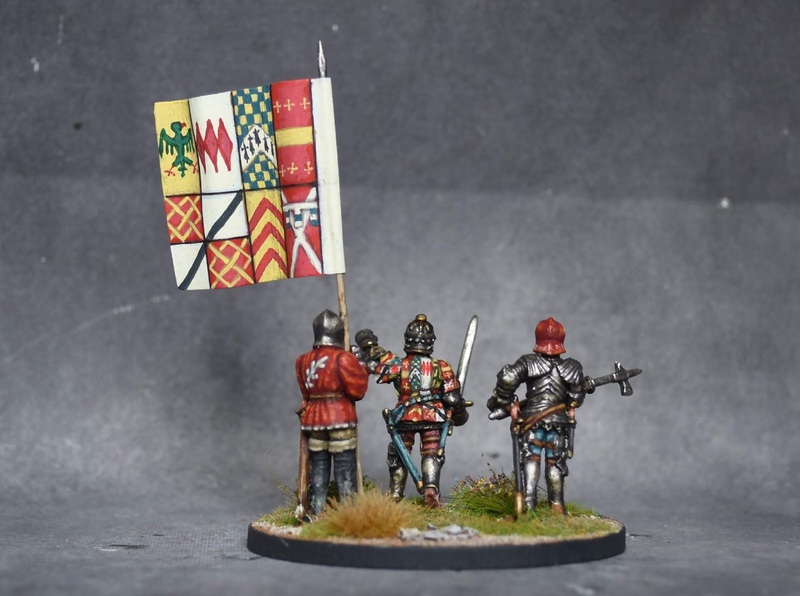 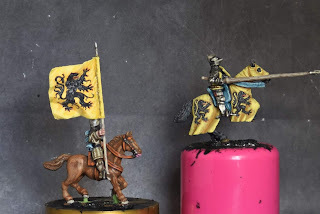 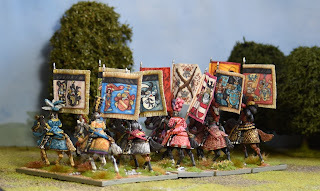 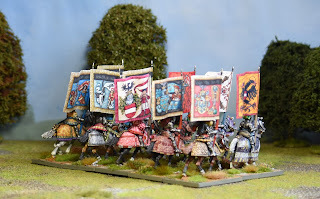 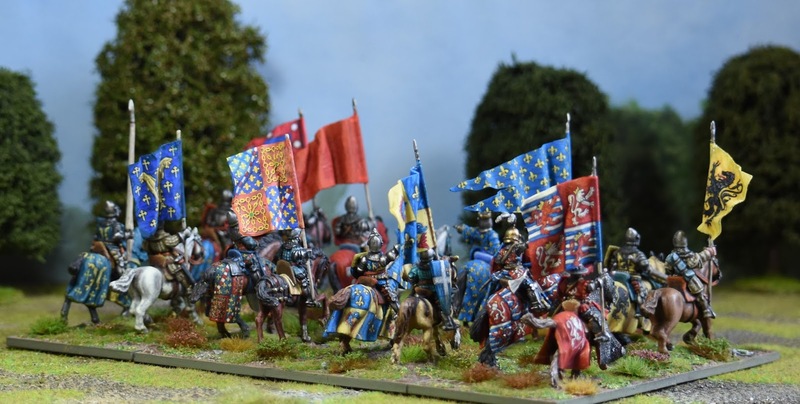 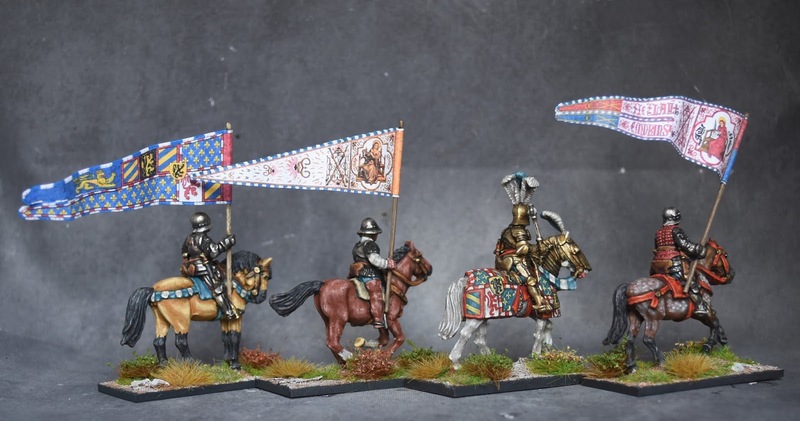 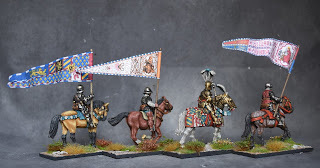 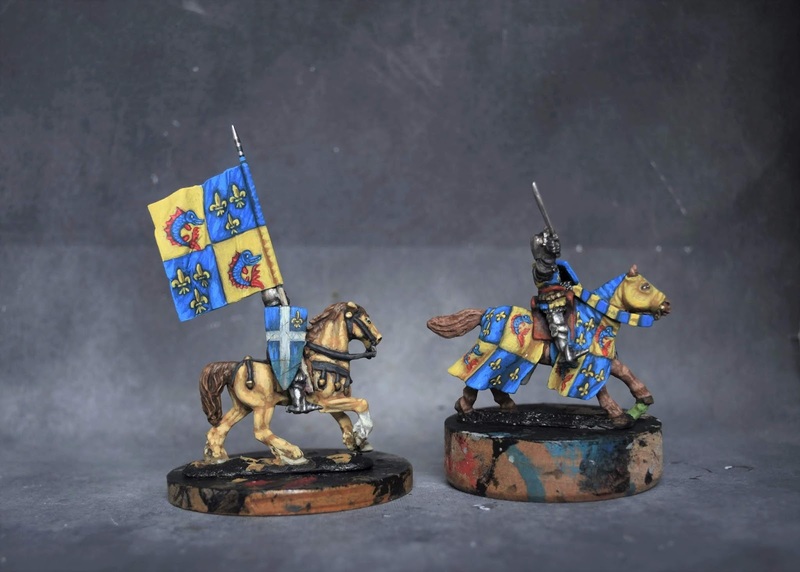 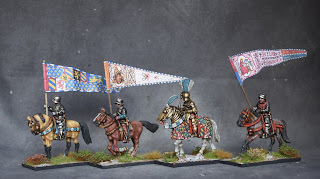 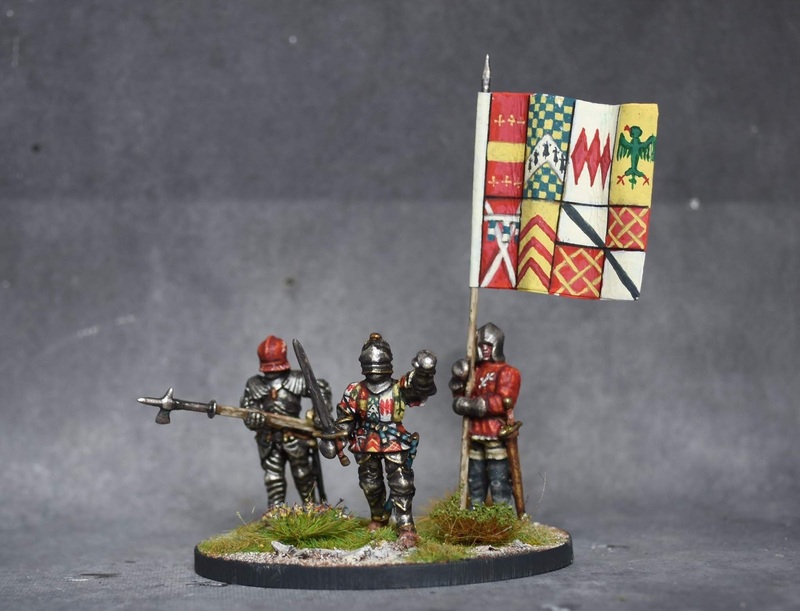 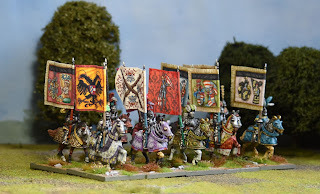 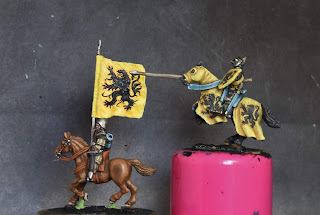 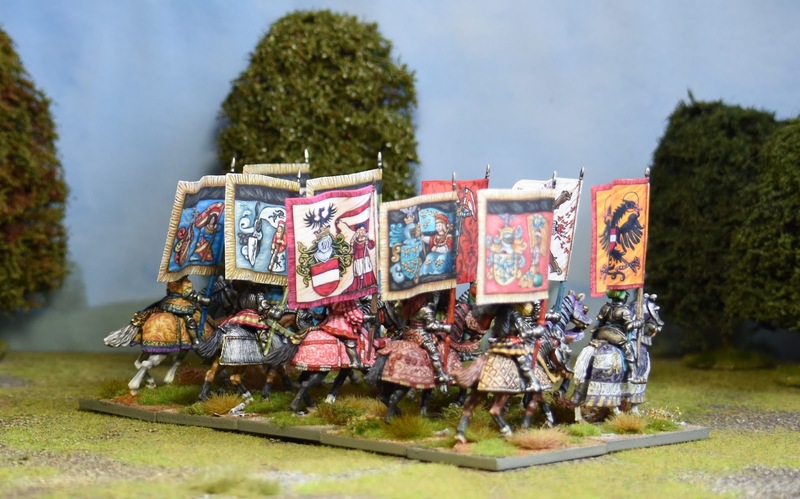 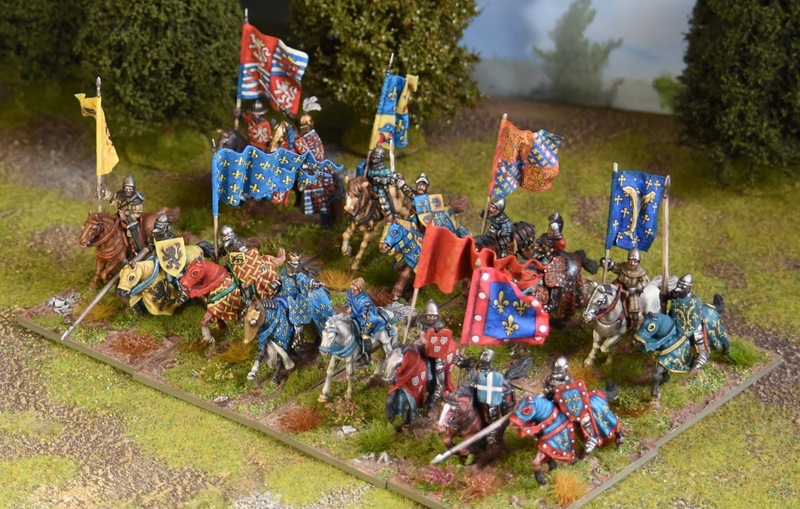 French knights based up, i cannot believe how much time its took to paint them but it was worth it, they are the most heraldic displaying miniatures i ever painted, what with the horses, shields,banners, and coat of arms. 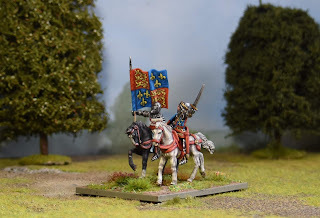 A couple of English nobles to keep Edward III commpany. 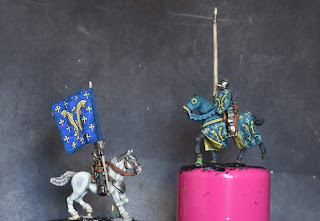 Left side is Richard de Beaumont, an English knight with the black prince at Poitiers, and right side is Thomas Beauchamp Earl of Warwick, one of English commanders at Poitiers. The last of the late Medievals i had lying around. 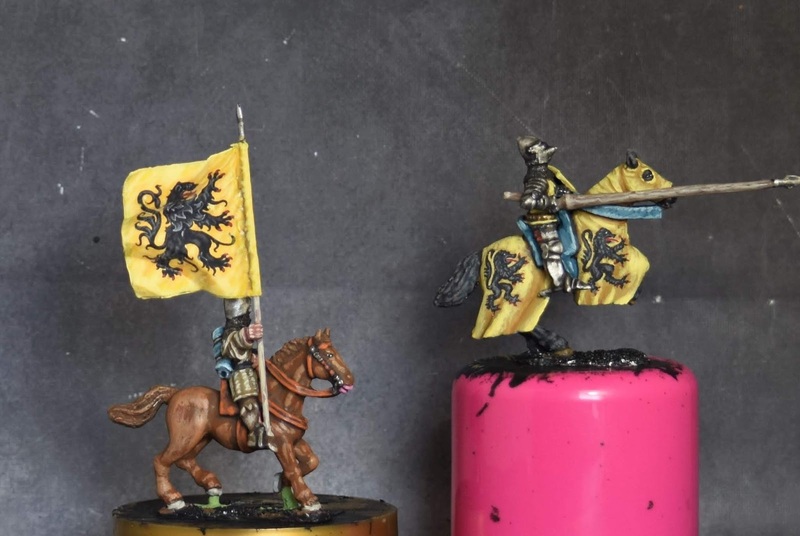 Steelfist minis. 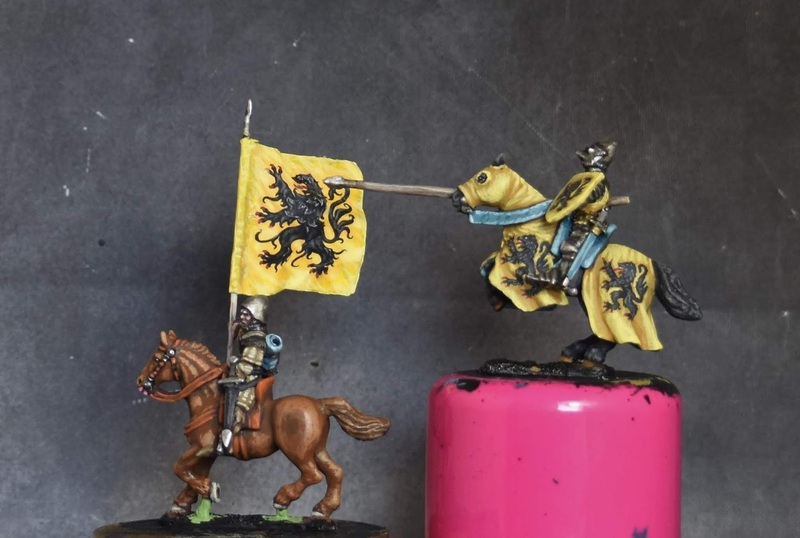 when i was washing the minis in the sink i accidentally lost the standard bearers arm down the plug hole, so added a shield to hide his armless state! 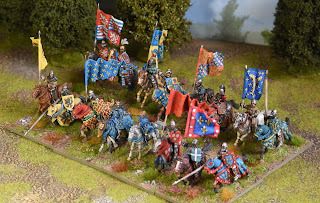 Here is another group of French HYW. This time King Jean II, Sir Austace de Ribeaumont carrying the french royal banner, and Sir Geoffrey de Chargny Oriflammebearer at Poitiers. 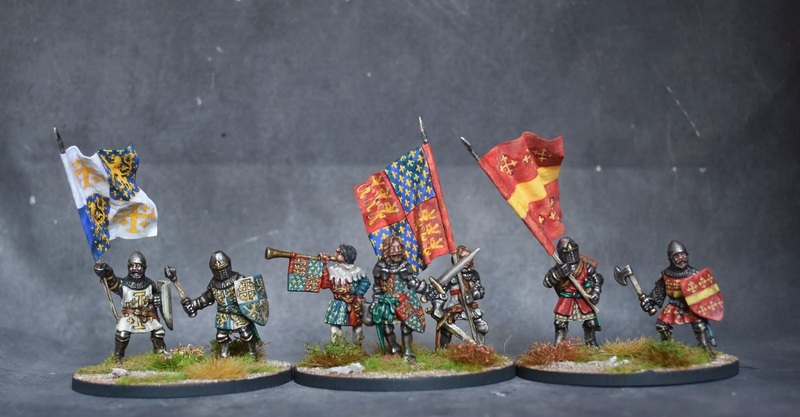 The figures are a mix of blacktree and crusader minis. I have used the old trick of linning the flags with tin foil to stiffen them and add more realistic waves. John, Count of Luxembourg and king of Bohemia, and standard bearer. Aged and near blind, he was killed leading his division attacking the Prince of Wales( Black Prince) division at Crecy in 1346. 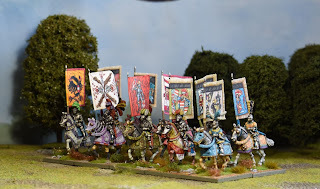 The figures are Claymore castings and are wonderfully animated! 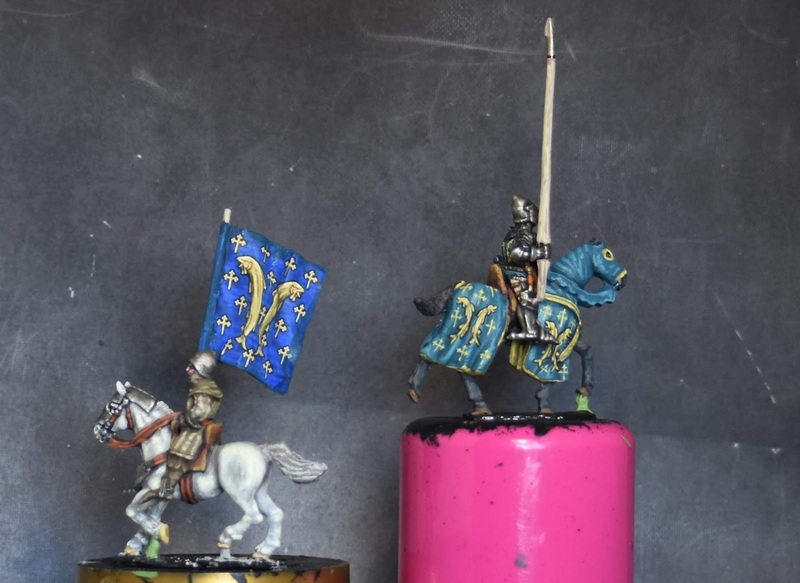 Handpainted flag. 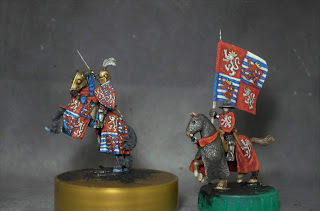 Its been along time since i did any 28mm medieval heraldic types, a long break from them you could say. 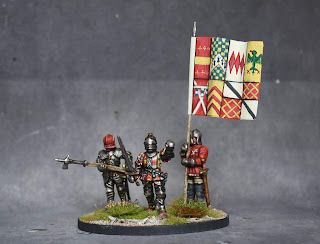 I have been getting the urge to return to them for a while so ordered some HYW miniatures. 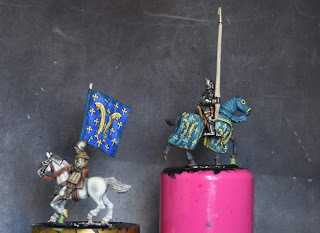 Ironically, and besides painting a few for front rank and few mounted knights i have barely touched the HYW so i have made a start on these miniatures, a mix of blacktree and crusader miniatures.